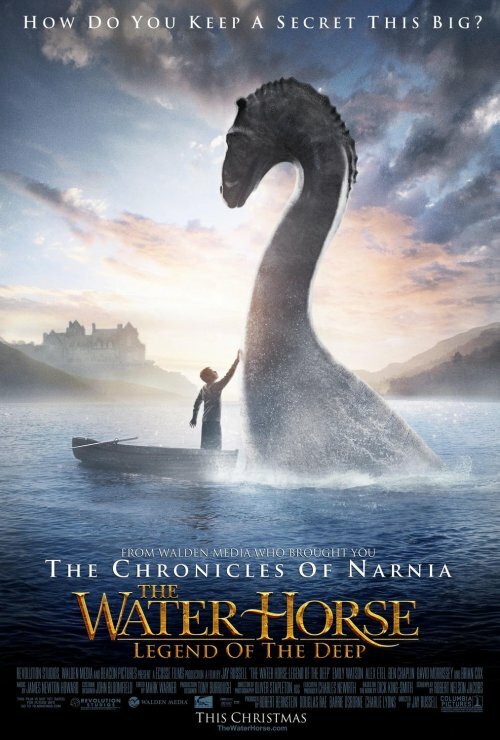 This new poster for The Water Horse is less cutesy than the last one, and in part because of that I think it does a better job of appealing to the young ones without repelling the adults that will have to take them to see the film. The poster also more clearly positions the movie as a magical adventure, making it seem closer to the mold of Narnia and less like a cute animals film. Of course, there are trade-offs with every decision. The last poster was quite endearing and it probably struck a chord with a certain audience. The new one strives to reach a broader audience, but it might end up not really connecting with anybody. I think this is a good way to go with the marketing, but it’s certainly not without risks. All that said, I have to ask: what happened to the creatures eyes? More specifically, why aren’t they there? Is it blinking or something? Looks very odd, doesn’t it?